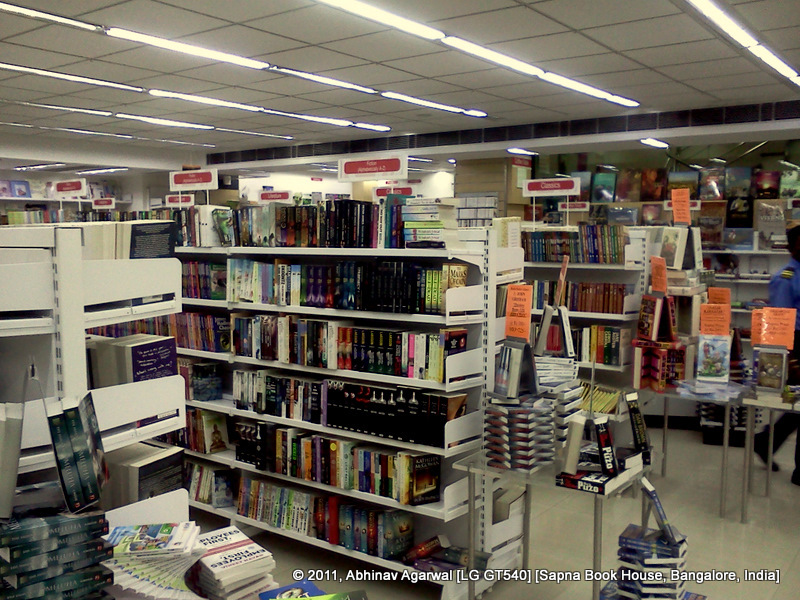 This is the Koramangala branch of Sapna Book House in Bangalore, located on the Raheja Arcade Road. 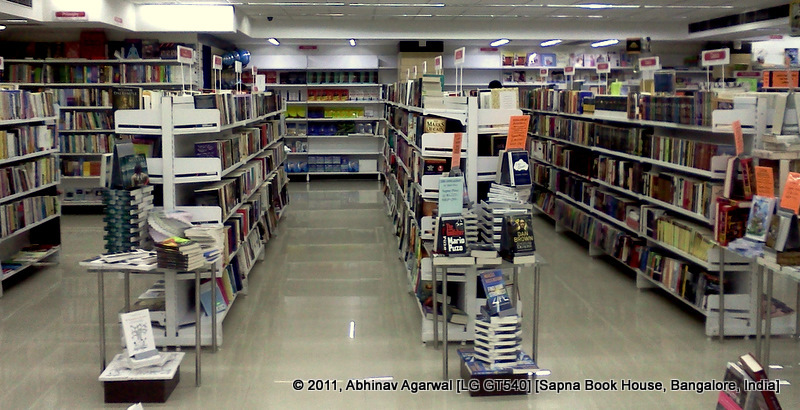 Sapna Book House advertises this as the larges book store/mall in India. I have no way of verifying that claim, but the store is large, spread across four floors. 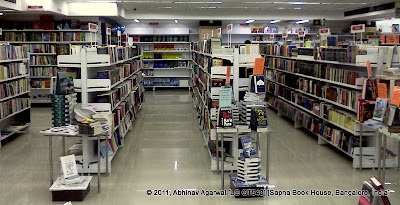 While it sells toys and other items besides books, the two floors dedicated to books do contain many books. The store is well lighted, and new releases are stocked in neat arrangements throughout the floor. As far as aesthetics go, for some reason or reasons I prefer Landmark. The tiled floor, the harsh white light, and the white shelves all combine to give a very antiseptic feel to the environs. When browsing books you want the store to exude a more homely, comfortable, and inviting feel. As most bookstores go, Sapna Book House also does not offer discounts on most books. Some fiction bestsellers are available at 20% or more off the list price, but most other books sell at the published price. As a physical retailer it is understandable that they need to to recover their costs and also make a profit decent enough to justify staying in the business and not turn their store into a multiplex or a mall. 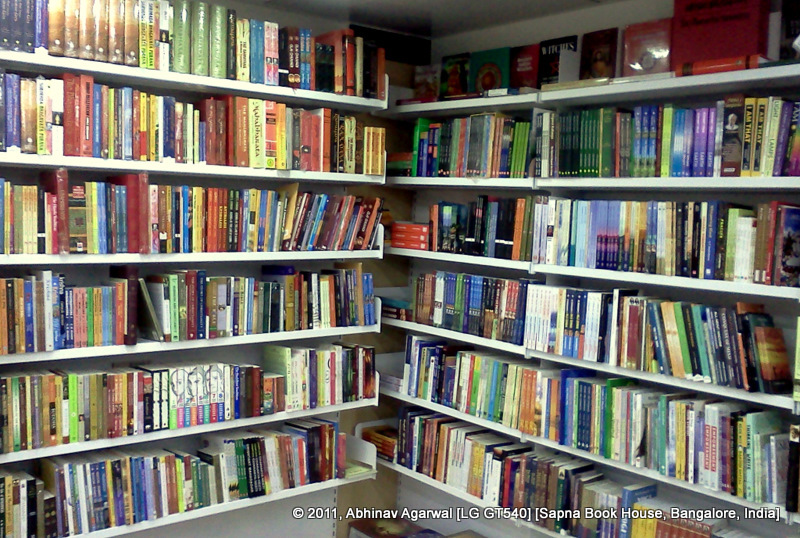 However, with the advent of online retailers like Flipkart.com or the older IndiaPlaza.com that offer steep 40% discounts on several bestsellers, it is difficult to see how traditional booksellers like Sapna will survive in this rapidly evolving market. Recent events in the US, where brick-and-mortar bookstores like Borders (Borders Group - Wikipedia, the free encyclopedia, The death and life of a great American bookstore - CNN), that filed for bankruptcy and then closed down all 400 or so of its stores, or the iconic Barnes and Noble (Barnes & Noble - Wikipedia, the free encyclopedia), that put itself up for sale, and is now relying mostly on its Nook e-book reader and ebooks to revive its fortunes, indicate that Indian booksellers will find it difficult to survive, let alone thrive, as more online retailers start to expand operations in India. 2011, Abhinav Agarwal. All rights reserved.